Running is fantastic and addictive. If you are here because you want to run and aren’t sure how fast and far to go without killing yourself and your newfound enthusiasm, you are in the right place. Almost anyone can run, you just need to put one foot in front of the other (sort of). This part is kinda “duh, yeah Gregory!” but it needs to be said: if you haven’t been athletic until now, you need to start slowly and build up. It’s not just your endurance that you need to build up but your entire frame (joints, ligaments, etc). For those of you who are already active in a sport that involves running around (soccer) or jumping (basketball) then you are slightly ahead. If you have been playing golf, don’t kid yourself. It’s not an athletic sport; it’s a past-time (insert flame wars in comments section, please). Let’s get this out of the way next. You will hear the old wives’ tale repeated like a mantra about how running is bad for your [fill in the blank – knees, joints, etc] but recent studies such as Why don’t most runners get knee osteoarthritis? A case for per-unit-distance loads and Does long-distance running cause osteoarthritis?show that this is not true. Running is great for your knees as long as you don’t overdo it and this plan makes that hard to do. However, nothing is foolproof. If your weight to height ratio is falling toward the too many doughnuts side of the scale, be aware that you will have more force on parts of your body that are not used to it. Let’s get down to it. How do you take it easy and build up your body and distance without injuring yourself with all this in mind? We are going to start with a distance that you can comfortably complete at an easy running pace. This could be .5 miles, 1k, 1 mile, 2k, whatever works for you BUT the pace should not leave you breathless. It’s the right pace when you can run and have a conversation with someone next to you at the same time. If you are alone, just talk out loud. People won’t think any less of you since they already think you are weird for running. Note that from here on I am going to think in miles but roughly convert to kilometers for the civilized parts of the world and that the plan below also works for runners who are already racking up the miles, just insert your own higher starting distance. 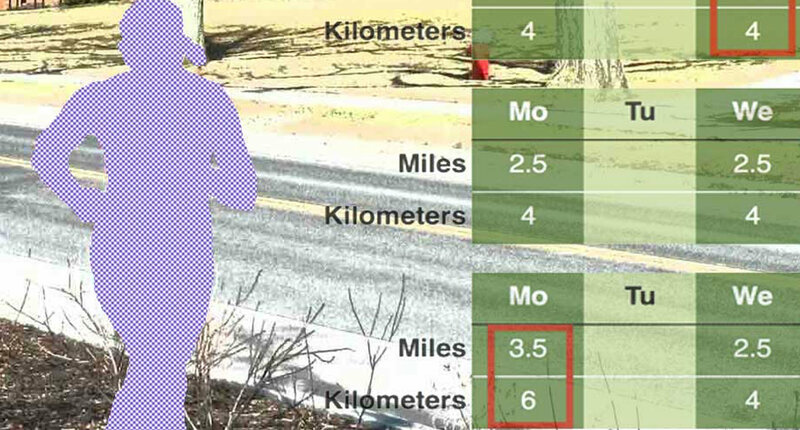 With this distance and pace decided, repeat the distance 3 times a week for up to 3 weeks before increasing it. For example, during your first 3 weeks you run 1 mile [rounding 1.5k] three times a week (3 miles/week [4.5k]). Assuming you are feeling good, it’s time to slowly increase your weekly distance. This is where we introduce an honest to goodness running secret: the long run. Add another day and run and additional 1.5 miles [2.5k] but leave your other days at 1 mile [1.5k]. Do this for at least 2 weeks before moving on. At this point you are going to have to listen to your body. If the long run day is still a struggle for you, keep this schedule until you no longer ache or feel rough at the end of your long run. On the other foot, if the long run day is easy for you, increase one of your normal days each week over the next 3 weeks to match the distance. 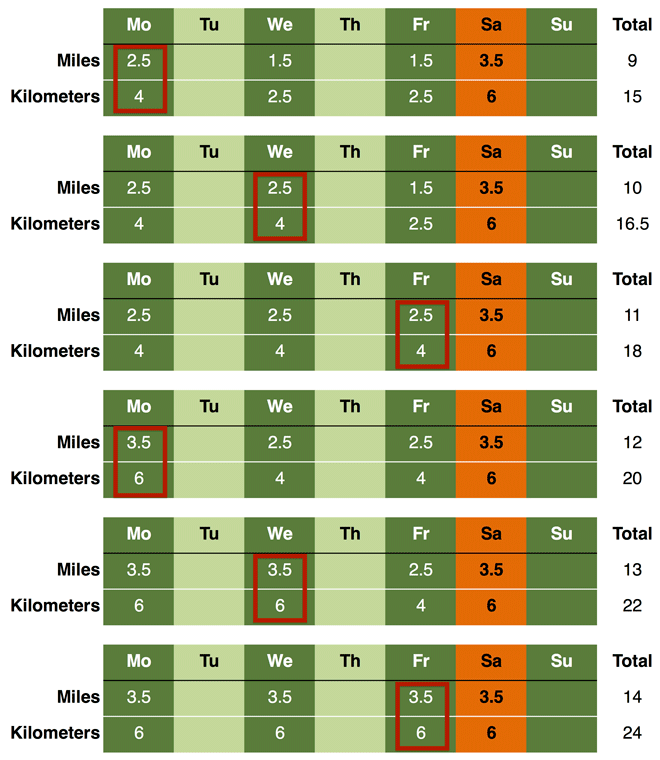 This example slowly ramps up your distance at the end of the 3 week period to 6 miles [10k]. You could run this weekly distance forever if you wanted, but let’s say that you really enjoy your runs and people giving you funny looks, therefore you want to increase the distance. Here are two ways. Concentrate on increasing your long run days over your normal days. 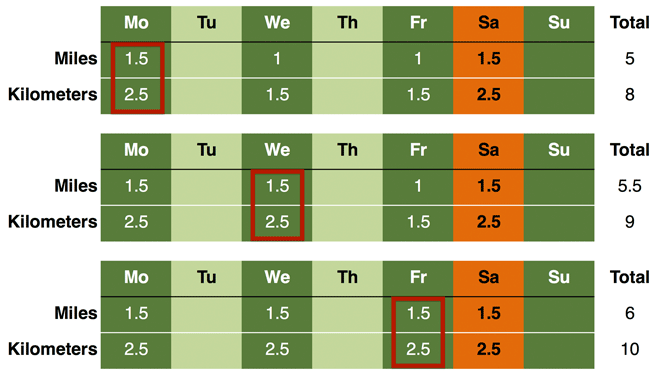 Each week, increase the long run distance by about 1 mile [1.5k]. At some point your long run day is going to be at least twice the distance of your normal day (see chart below). BEHOLD! You are a true athlete and all the other runners should bow down to you… just don’t tell anyone or they’ll be jealous. Your prize is that you can pick one of your normal days each week to increase by 1 mile (1.5k) until they all match your long run distance. At this point it is rinse and repeat (increase long run until double short run, etc…) until you reach a mix of long run and normal day mileage that line up with your running goals. Slowly lose the long run day. Each week, add 1 mile [1.5k] to one normal mileage day until each one matches the distance of what was previously your long run day. Moving forward from there, you can continue to increase one day each week in rotation. The order in which you increase the days doesn’t really matter as long as they all reach the same distance before moving on. As mentioned above, continue to increase or plateau your running distance based on your own goals. Why choose one strategy over another? You might have time constraints and can’t fit a long run into your schedule which becomes increasingly harder as you up your distance making suggestion 2 more appealing. Or you may find that you are insane like a lot of runners (including me) and really enjoy the longer runs. Also suggestion 1 allows you to rack up respectable weekly distances while keeping your weekday running commitment smaller. This has obvious benefits for those with M-F work commitments. Obviously, I have used a very short distance as the starting point in my example but you can apply the process to longer distances by asking your child to do the math. I have also given plenty of breaks between runs. It’s not impossible to run 5 days a week or more but give your body a break one day a week at least. Also, be careful that you don’t radically increase your distance over a short period of time by thinking that running 1 mile [1.5k] four times a week can be easily and safely be increased the next week to running 2 miles [3k] four times a week. 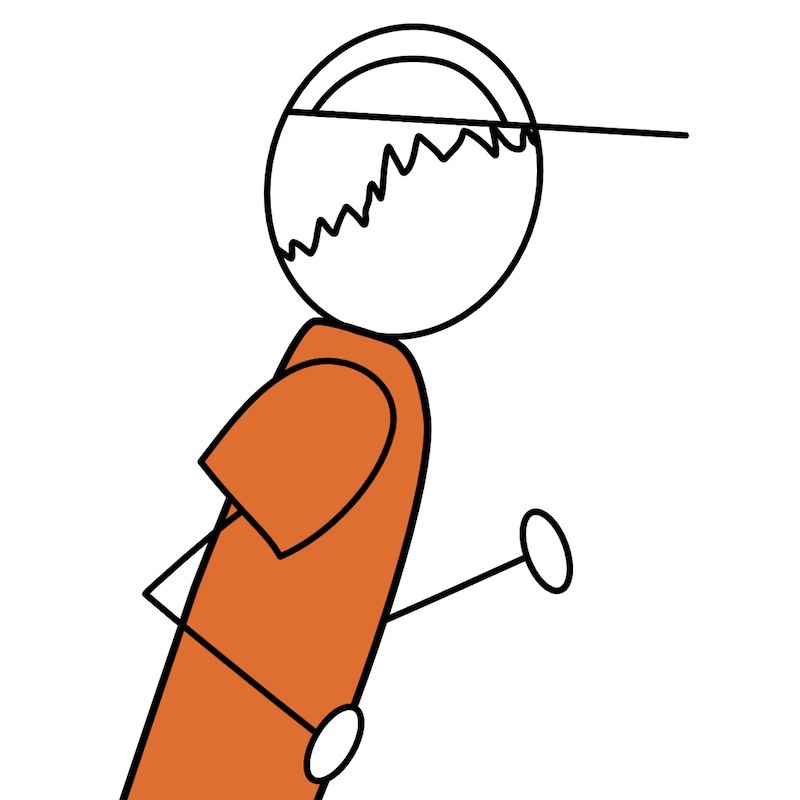 Once you know what your body can handle, you can mess with the math and try some crazy (fun) distances that go well beyond the slow ramp method. At that point you are only limited by your dreams.